Keith Imper: Thanks for sitting down with me Sharon. I know that everybody on the Island, and many off, are curious about what’s happening with MICA. But, let’s discuss this latest City Council meeting. What exactly happened at this meeting? Keith: What does the vote from the city council session on Tuesday mean for MICA? Sharon: It means we have the support of the city council to explore a mixed-use partnership; they recognize the community benefit of a space for the arts and agree that it’s a unique opportunity to provide this benefit for the community. Sharon: As we see it, next steps include: First, reach out to the council for their support of the arts. Second, join us at the MICA study session with the City on Monday Sept. 17th. We will be sharing a report of what we heard from the community listening that we did throughout the summer. Keith: How will the Sept. 17th Study Session be different from the study session in February? Keith: Thank you, Sharon. It sounds like exciting things are happening for MICA. watch the City Council meeting here. The full 45-minute setup + discussion, starts at 59:30. If you want to see council members’ discussion and the motion, start at 1:24:00, ending at 1:46:00. If you didn’t see the letter from the MICA Board of Directors to the City Council regarding their commitment to a space for the arts, click here. *Interviewer Keith Imper is a former MICA employee, Arts Consultant, and Advocate for the Arts. 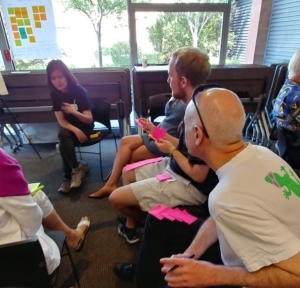 We had another all-community visioning session on July 28 at the Mercer Island Community Center. There were about 25 islanders in attendance and we gladly were surprised by the number of walk-ins, but our goal has been to reach every Islander that wants to have a voice. We began by reinforcing that this was a “visioning” session and our hope was for the room to think big. And they delivered! There was plenty of robust discussion about the greater value of arts. In general though, the conversations stayed close to the themes we’ve heard so far around the desire for more community-building, the need to increase collaboration between arts groups, and a hunger for more arts-related activities. We heard many comments about existing community spaces being too crowded and how tired some residents are of having to shuttle their kids off island for activities. Many agreed that whatever the space ends up being, it should be inviting and open to all. There were also comments about the importance of providing access to the arts for all, because this sometimes results in homegrown artists making a name for themselves in the mainstream (which then becomes a source of pride for the community). 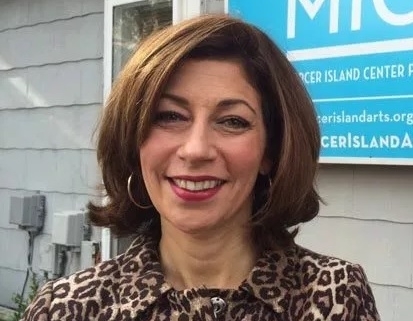 We also heard excitement about potentially bringing new life to the town center and having more reasons to stay on the island for entertainment. We’d be remiss not to point out that while a majority of the conversation was positive, some participants approached the discussion more concern than others and brought some valid, important questions to the table. Most of the concerns expressed that day reinforced what we’ve heard before like cost, parking and long-term sustainability. 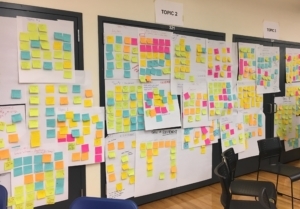 Community Visioning … the Whole Community! We believe in the power of the arts as a vehicle to teach us profound lessons about the most important art of all, the art of being human. Arts have an uncanny ability to circumvent politics and ideology. Art brings neighbors together to share meaningful experiences and creates important conversations and collaborations in a community that otherwise may not happen. With art, we grapple together with life’s most vital issues. Thank you to everyone that came together with us on June 11 to envision the future of arts on Mercer Island! 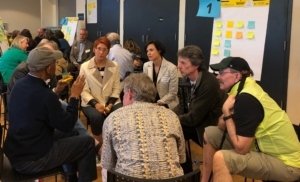 Mercer Island Center for the Arts (MICA) is conducting a Community Visioning Dialog, during the spring and summer of 2018, to get direction from the community on the needs for the future of arts on MI. We engaged, Phinney Bischoff, a reputed local research firm, to co-lead and manage this study. Input is being collected from individual interviews, small group sessions, large community forums and an online community-wide survey in July. We asked for your participation on a beautiful Monday night in June for a visioning dialog about a space and a place for the arts on Mercer Island and you showed up. Wow, did you ever show up! Over 100 Islanders gathered together at the Boys & Girls Club (PEAK) and spent two hours engaged in a robust, respectful discussion on three topic areas: The Big Picture, Imagining the Possibilities, and Programming and Activities. There were valid concerns voiced around cost and sustainability, as well as site selection. We found people who came in uncertain or opposed to the project willing to and engaged in the conversation. We also heard a handful of comments along the lines of, “Are we thinking big enough?”, not to mention the many conversations supporting the idea that there is a hunger to bring a sense of excitement and spontaneity to the island. Together these insights are leading us to believe that perhaps the definition of arts and culture might be broader for our community than we originally thought. There seems to be a lot of excitement about the project and a genuine desire to find a way forward and we are very encouraged by it. So, what’s next? If you couldn’t participate in the June 11 forum, we’ll have another one in late July, in addition to an on-line community-wide survey on the same issues. The small group input sessions will continue throughout the summer and we’re always happy to meet one-on-one. MICA will share the findings with the community at the end of the study in September, and use the input to direct the decisions on site selection and programming for a potential future arts center on Mercer Island. Arts brings us together. Thanks for coming together with us on June 11. For more information visit MercerIslandArts.org; email info@mercerislandarts.org; visit the MICA office at 7710 SE 29th – summer office hours 9:30-1:00pm, M-Th. or ring 206-715-7671.
https://www.mercerislandarts.org/wp-content/uploads/2018/06/June-11d.jpg 1619 4139 Paul Shoemaker https://www.mercerislandarts.org/wp-content/uploads/2018/06/mica-logo-updated.png Paul Shoemaker2018-06-21 14:17:502018-06-21 14:17:50Community Visioning ... the Whole Community!